On Monday evening, as we were eating dinner, we saw a huge bolt of lightning out our sunroom window. With it, a simulataneous clap of thunder and...the ringing of a toy microwave and telephone?? Yep. Apparently, there was so much static in the air that it jolted the battery-operated toys in Katie's kitchen into action. We thought it was pretty cool until it occurred to me that a jolt that could hit the play kitchen just might have hit the computer in the room above it. Michael went up to check and he didn't come back down promptly. I took that as a good sign--must have gotten distracted by his e-mail. No...he was up there trying to get the computer to even turn on. Long story short, the computer was fried and so was the cable modem. We fought with the cable company (who graciously said they'd be out August 30th) and Michael spent hours fetching, installing and troubleshooting a whole new system. And here I am! So what did I do with my computer vacation? I remembered that Meredith had invited us to celebrate our kitchens and I turned my attention to making it something worth celebrating.I started by clearing the clutter off the refrigerator door. I don't really like a lot of busyness there. I've got some magnets of liturgical art that I love (they were a gift from a friend) and some others that are tiny little miniatures of the art from my aunt's collection, hanging in the gallery that bears my uncle's name. These are paintings I want my children to recognize immediately as familiar friends. That's about the extent of my "Fridgeschooling." I've also got a MomAgenda family calendar and a posting of the family rules and a current chore chart for this week. 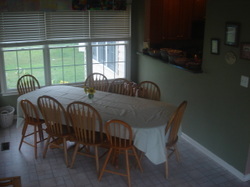 The table in the sunroom happened a year or so ago. 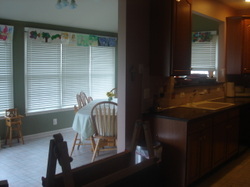 The eating space in the kitchen proper is precisely in the middle of the house. Our table is large and there are lots of chairs around it. I felt like I was always bumping into it. I also didn't really like looking at the prep mess while eating dinner. So, we moved it into the sunroom. While disscussing Simple Elegance, Molly mentioned angling a table. I tried it and it's so much nicer that way! 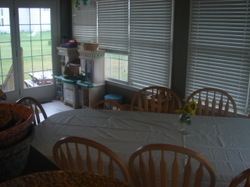 Before moving the table into the sunroom, that room was mostly a play space. My children like to play close to me and I'm usually in the kitchen. We've left the play kitchen and some baby doll accoutrements and in the corner are a wooden castle, some trolls, a basket of wooden train tracks and trains, and some Lincoln Logs. 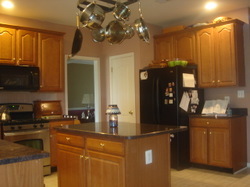 There is not an abundance of cabinet space in my kitchen, so we hung a pot rack above the center island. I also use the high counter between the kitchen and sunroom to display and store stoneware serving pieces. My sink has a beautiful, wide view of the backyard and I frequently stand there watching family soccer games while cooking and cleaning up. 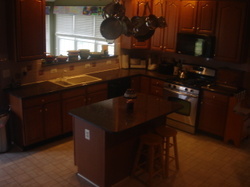 My kitchen sits squarely in the middle of my house, a fact that rather irritates me sometimes because it's rarely as neat as it appears here. But there is no denying that it's the heart of my home!